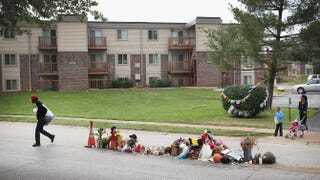 On Sept. 11, 2014, in Ferguson, Mo., more than a month after the shooting of teenager Michael Brown, a memorial remains in the middle of the road where he died after being shot by Officer Darren Wilson. The grand jury convened in the case of the Aug. 9 shooting death of Michael Brown in Ferguson, Mo., has been given an extension until Jan. 7 to decide whether to bring charges against police Officer Darren Wilson, according to the St. Louis Post-Dispatch. The jury had been due to end its four-month term last week, but St. Louis County Judge Carolyn Whittington extended the deadline an additional 60 days beyond the six-month maximum. But as the St. Louis Post-Dispatch notes, although jurors have been given a longer deadline, it doesn’t mean they will need that much time to make their decision. After hearing testimony, the grand jury will decide whether they believe Wilson committed a crime. The jury is made up of six white men, three white women, two black women and one black man, according to CNN. The St. Louis Post-Dispatch notes the tension surrounding the jury’s decision, since many fear that protests and violence may return if Wilson is not charged. Read more at CNN and the St. Louis Post-Dispatch.